The creator of Logo Experiments (a fun repo that houses every possible way to draw a logo with modern frontend techniques) and our newest developer, Bryan, doesn’t do things halfway. He’s the kind of person who does a lot of research and prototyping to find the right solution, and then he dives into making things great. It was that same determination, that we just couldn’t ignore when Bryan courted us during the interview process. 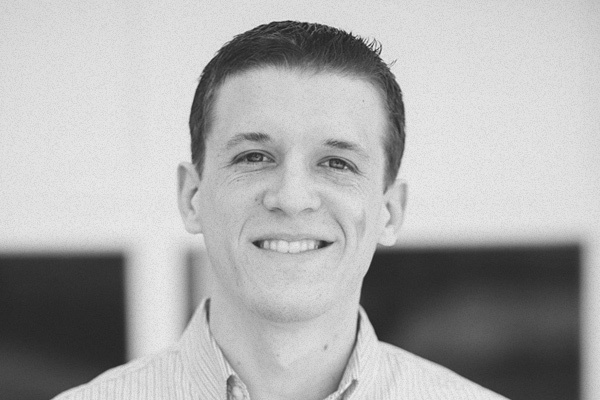 Bryan is a big contributor to the open-source community, and we’re excited to see him bring his passion for thoughtfully and powerfully solving problems to our clients. Like many of today’s web workers, Bryan is self taught and learned by designing and developing freelance websites while going to school to be a Mechanical Engineer. When he graduated, he decided to move away from thermodynamics and do what he really enjoyed—building the web. And he’s been honing his skills ever since. Bryan made the journey to join us in Dayton, OH, from Washington, DC, with his wife and three kids (all under the age of five). In addition to spending time with his family, Bryan likes to play piano and stay active doing all sorts of things, including running and riding his bike to and from work each day. Like many of us, he also likes to spend his free time coding and contributing to the open-source community. Part of why Bryan loves being a developer is the collaborative community that encourages everyone to advance the way the web works. If you’re looking for someone to build cool things with, you can also catch Bryan writing on his personal site or talking about quality code techniques (and occasionally his bike ride) on Twitter.